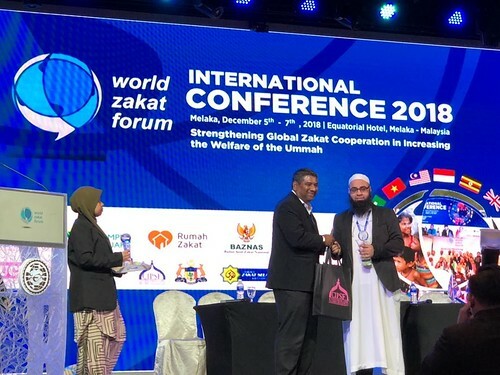 At the beginning of December, the National Zakat Foundation (NZF) travelled to Melaka, Malaysia, to represent the UK at this year’s annual World Zakat Forum (WZF). Just like NZF, the World Zakat Forum develops and encourages the practice of Zakat, in order to strengthen Islam, unify Muslims, and amplify the impact Muslims are making on their own communities, as well as the global community. The World Zakat Forum holds regular international conferences, and invites the world’s leading experts and organisations to join the discussion on Zakat, its purpose, potential, collection, distribution, and impact. WZF asked the National Zakat Foundation to lead a seminar on Zakat and its role in Islam in the twenty-first century. Our Head of Research, Mufti Faraz Adam, presented NZF’s core beliefs and aspirations to an audience of experts, researchers, policy makers, business leaders, and philanthropists in his lecture ‘Zakat Philosophy and Goals: Establishing a True Zakat Framework’. Mufti Faraz says, “It was an honour and a privilege for National Zakat Foundation to represent the UK at the World Zakat Forum 2018. We presented our research on the philosophy of Zakat and encouraged a faith-centred framework which was welcomed by participating organisations and attendees. It was interesting to see how different countries are implementing the eight categories of Zakat to meet their contextual challenges and circumstances. Member countries were in favour of the idea of local Zakat distribution as a catalyst for the advancement of faith and socio-economic reform. NZF is pleased that Muslim leaders and organisations around the world are working towards creating an effective and efficient system of localised Zakat, as this will only further Islam and benefit Muslims. We’ll continue to lead the discussion on local, transformative, and impactful Zakat, and to support the World Zakat Forum in its aim to develop the Muslim world’s understanding of Zakat and its unlimited potential.